From coast to coast, SMART is improving asset reliability for 40+ utilities. MinMax continues to enhance its SMART family of programs based on the participation and feedback received from its SUPER users. One of the key highlights of the latest release is the capability to take and store multiple pictures instantly at any inspection question. The pictures can be retrieved and viewed wherever the questions are displayed. 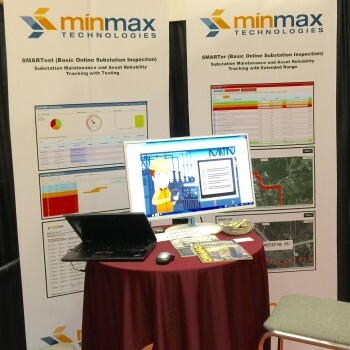 This latest release was showcased at the TVPPA’s 2015 Engineering & Operations conference held on August 5th and 6th in Murfreesboro, TN. The Tennessee Valley Public Power Association, Inc. (TVPPA) is the nonprofit, regional service organization that represents the interests of consumer-owned electric utilities operating within the Tennessee Valley Authority (TVA) service area. TVPPA members include both municipal and electric cooperatives, and they serve more than 9 million customers in Alabama, Georgia, Tennessee, Mississippi, Kentucky, North Carolina and Virginia. At this conference, MinMax also introduced a white paper on the simplification of performing transformer dissolved gas analysis based on Duval’s triangle and Excel Solver. This intuitive approach will be offered as an integral part of the SMART Dashboard which is already equipped to import the readings of various DGA gases in a grid form or as questions.